This beautiful hinterland retreat has just recently completed an extensive renovation and captures the magic that the hills of Coorabell offers. 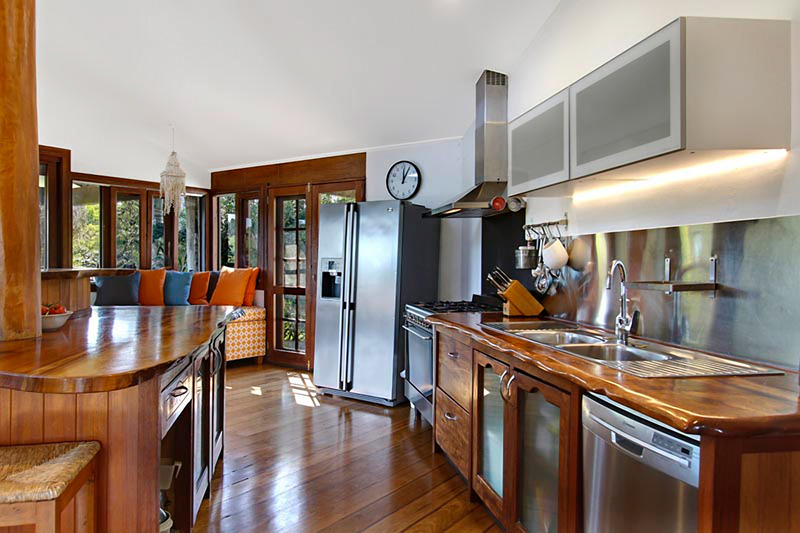 Just a short 15 mins drive from the stunning beaches of Byron Bay, the property features polished timber floors, large decks, and a resort style 12 metre wet edge pool and spa, as well as cabana with stunning hinterland views. The main house features an open plan living, kitchen, dining area with concertina doors that open out onto a large deck space with outdoor lounges and an 8 person outdoor table setting and BBQ. From the end of the deck you can walk down the stairs to the spectacular wet edge pool and heated spa with glorious views looking out across the valley. The main part of the house has lovely, character filled polished hardwood timber floors and cool furniture pieces including an eclectic chandelier, a huge white wash mirror and a corner daybed, perfect for curling up on with your favourite book. The living area offers a state of the art entertainment system including a 55" LCD 3D TV, DVD and Sonos sound system. The kitchen is well equipped for cooking up a feast on those nights in. There is a bathroom with spa bath on this main level and a Queen bedroom upstairs with balcony. The new wing extends down from the main house and features a TV room with fold out lounge, 2 queen bedrooms with built ins and the 2nd bathroom with a separate shower and bath. Every room opens out on to the lower deck with fantastic views across the wet edge pool and valley below. This 10 acre property is located at the end of Koranba Place, Coorabell, making it very private. There is a separate house with permanent tenants living next door. There is no common wall an the two properties are separated by a large double bay gararge. Coorabell is a wonderful little rural area and is only 10 min drive from Bangalow and 15 min drive to Byron Bay and Mullumbimby. Group restrictions - maximum of 7 adults at the property.